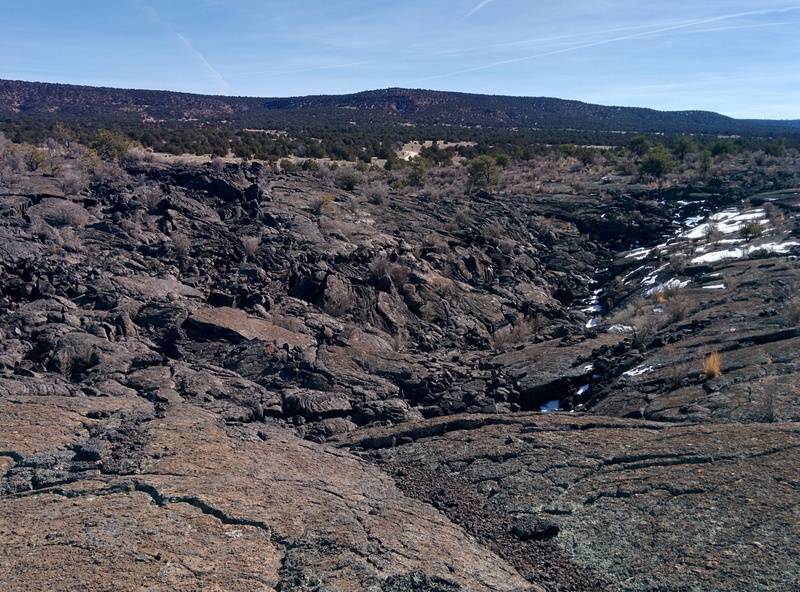 We spent our first full day in the El Malpais National Monument as a rest, relax and rejuvenate day. We had limited out caloric expenditure to taking a short drive to visit the La Ventana Arch and its short, easy hike and then lounged around the campground catching up on reading and writing for the rest of the day. That rest period worked and now Willow and I were invigorated and ready for a more strenuous exploration. We noticed a tattered map on the campground’s weathered notice board and saw a faded mention of some place called Lava Falls and decided that sounded like just the spot. Heading out from the campground we first took a detour to the right to head back a mile or so and check out a sign that we had passed when we first arrived. It had mentioned “Sandstone Bluffs” on a brown sign with white lettering which traditionally denotes something natural and beautiful, two of our favorite things. 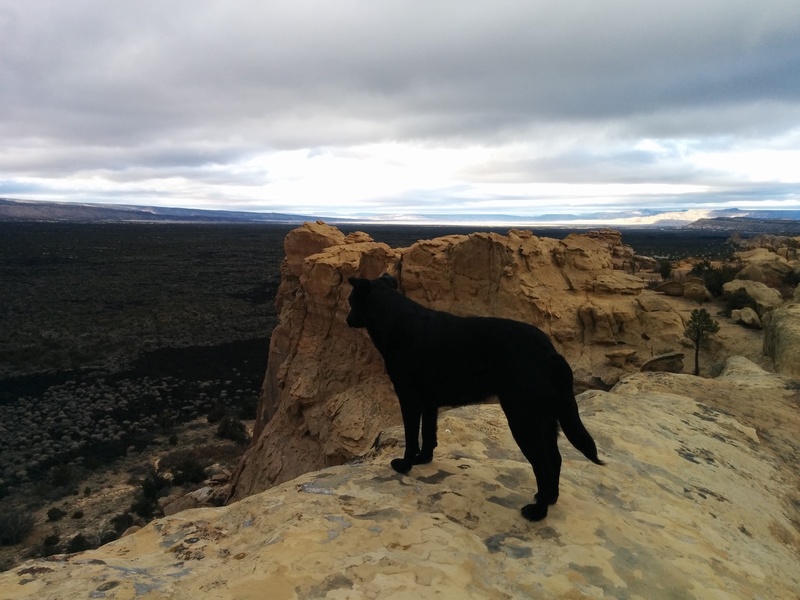 Willow adds “stinky” to her short list but what the bluffs lacked in aromatic pungency it made up for with a sweeping view of much of the National Monument itself. The sandstone here was formed by the compressed sedimentary deposits that were once the floor of an ancient shallow sea that covered this area between 138 million and 63 million years ago. Once the seas disappeared many more millions of years of erosion sculpted these bluffs into the shapes we see and appreciate today. We visited at the “wrong” time of the year but have heard that small potholes in the sandstone, or tinajas, fill with water after summer rains and create small, temporary ecosystems. Among the creatures that make homes in these short-lived oases are fairy shrimp, tadpole shrimp, Spadefoot toad tadpoles and various water insects. There are no constructed or marked trails to the base of the bluffs and finding a safe way down can be difficult. 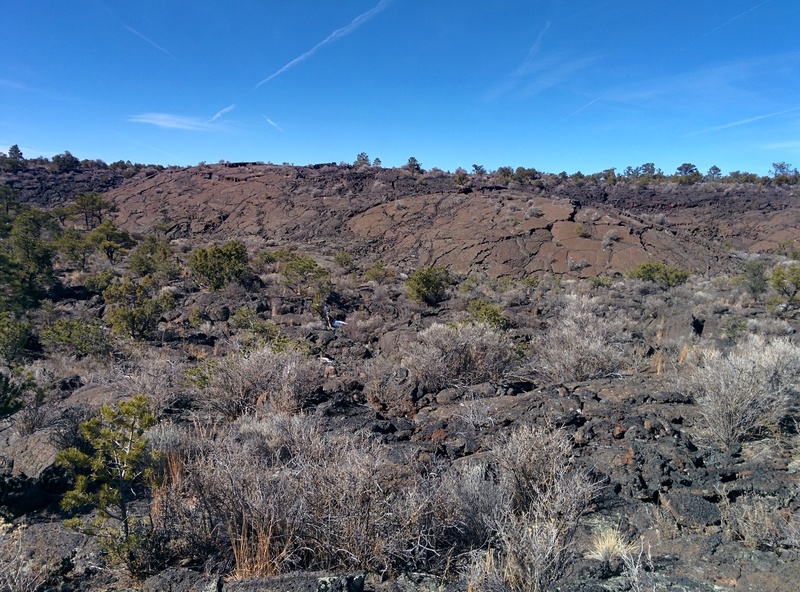 Since we were on a timeline to get to the Lava Falls we skipped even attempting that and so forfeited any chance of finding some of the small sandstone arches, the abandoned homestead or some petroglyphs at the bottom of the bluffs. Because we were on a mission and because this was an adventure and we didn’t know all of the sights to see we also missed the opportunity to check out the remains of the Garrett homestead and learn about the hardships of homesteading in this area back in the day. Sadly we drove right by its location along the gravel road into the Sandstone Bluffs Overlook itself. Duh. Had we stopped by we would have seen that the homestead consists of a residential structure with some standing wall remnants and ruins of several outbuildings and was built between 1935 and 1937. Many of the people who homesteaded in the El Malpais area came during the Great Depression and to get out of the Dust Bowl that was the Midwest. Homesteading here was not easy. Homesteaders had to make $800 worth of improvements to the land (over $11,000 today) and actively live there for three years (at least seven months out of the year) before the land was theirs. Many people did not succeed and had to move to nearby developed areas, like Grants, to survive. So, enough about what we didn’t see. We’ll check those items out in person/dog the next time we pass through the area. What we did see and had a good time doing so was the Lava Falls but first we had to drive the 21 miles from the Sandstone Bluffs. Once we found and turned off onto Lava Falls Rd and pulled into the dirt parking area we were happy to see we were the only ones here. While I know that hardened lava can cut up or cause other damage to a dog’s paw pads we had been “in the field” for a month and I was pretty sure her pads had toughened up sufficiently for this short (a little over 1 mile round trip), relatively flat walk but I still carried her thicker-soled set of booties just in case. Happily we never needed them. 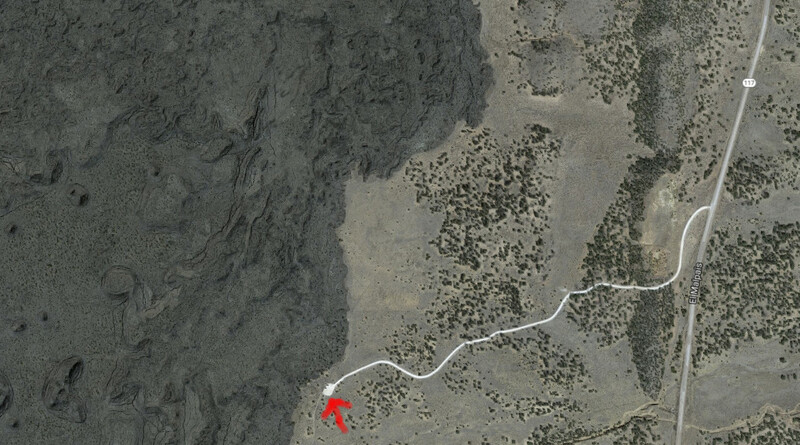 From the satellite image above you can see that near the parking area the terrain sharply transitions from light desert scrub (on the right) to lava fields on the left. 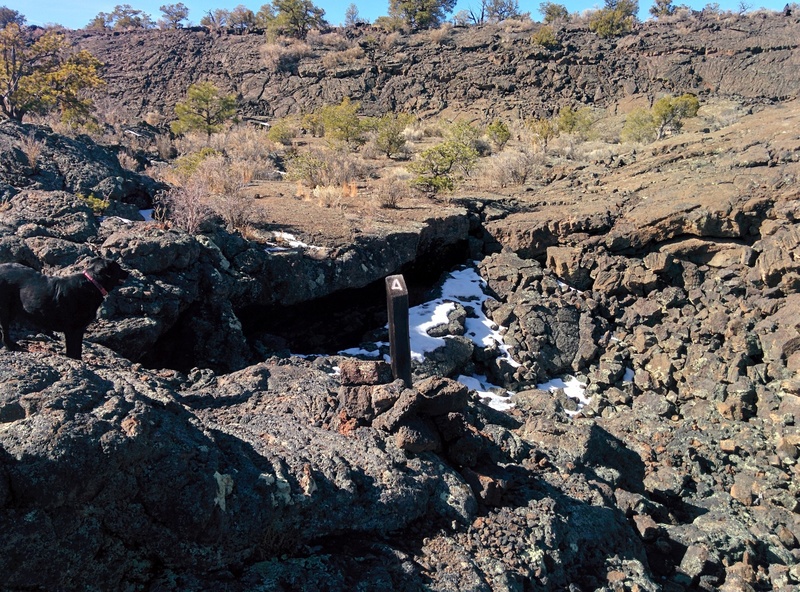 The Lava Falls Area is technically part of the McCartys flow and is the youngest of the lava flows in the Monument at about 3000 years old. On the geologic time scale that is a mere blink of an eye. Named for the nearby town of McCartys (about 36 miles Northeast) the source of the flow is a small shield volcano aptly named McCartys Crater and the town lies at the Northernmost reach of the volcano’s flows. 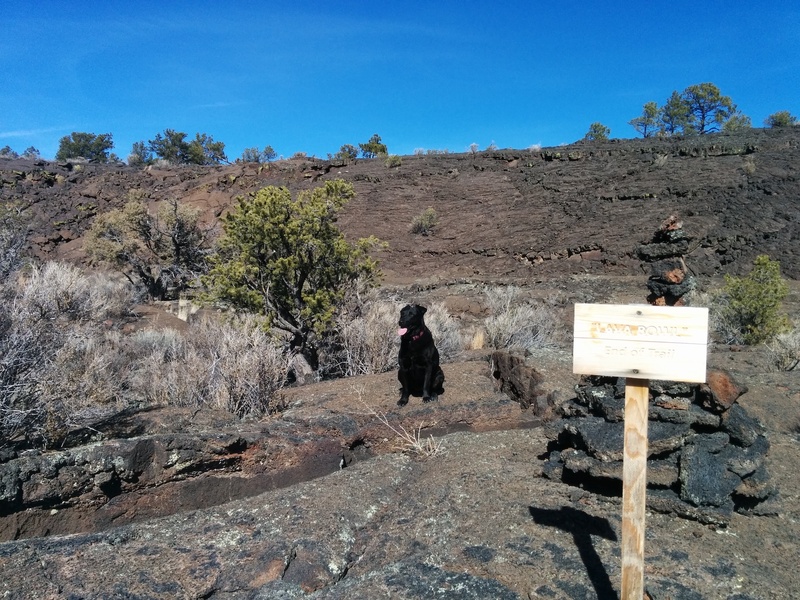 The trail has a few wooden markers at specific spots which correspond to points of interest on the Lava Falls Trail Guide. While exploring this landscape the trail is marked differently than how you might normally expect to see trails marked and you have to adjust your hiking style in order to stay on it. 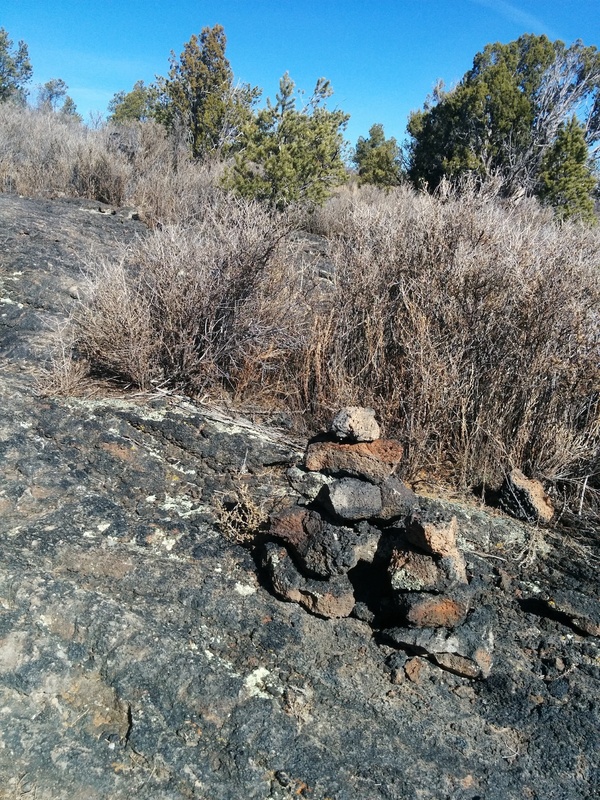 Instead of a constructed walkway, fencing, handrails or signs there are small piles of rocks called cairns used that are spread out at relatively close intervals so that you can find and aim towards your next cairn before you step away from your present cairn. The other part of this equation is that the ground is hard, sharp, sometimes crumbly rock with numerous fissures running through it that are easily large enough to fit your whole leg into much less a small child or medium black dog. So on the one hand you really should walk with your eyes constantly sweeping the ground in front of you so don’t step poorly and twist, break or otherwise seriously injure yourself. Merely tripping and stumbling onto the ground hand-, wrist-, elbow-, knee-, face-, or head-first will inevitably cause severe trauma to your soft flesh to say nothing of broken bones. This would be the land-dweller equivalent of getting slammed up against a hard coral reef. Sharp, nasty stuff. On the other hand if you lose sight of the trail of cairn pointers you can easily leave the relatively safe, commonly used route and end up…elsewhere. So, a nice balance of your head on a swivel and your eyes on a stalk is what’s called for in this environment. With the above cautious caveat in mind once you start off along the trail you will see essentially all the different types of lava and lava features that you would see even near an active volcanic zone such as on the island of Hawai’i. 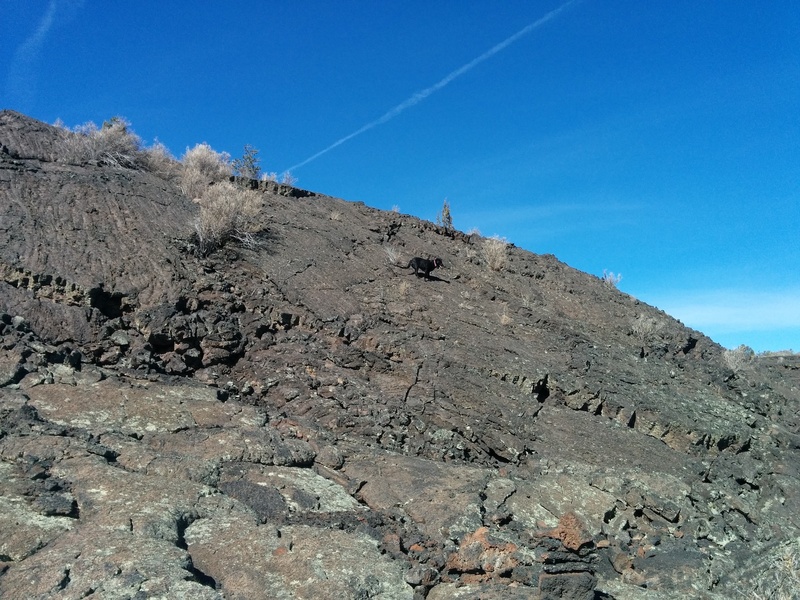 All lava starts life as basalt and then morphs into one of its many forms depending on the terrain, weather, pressure etc. 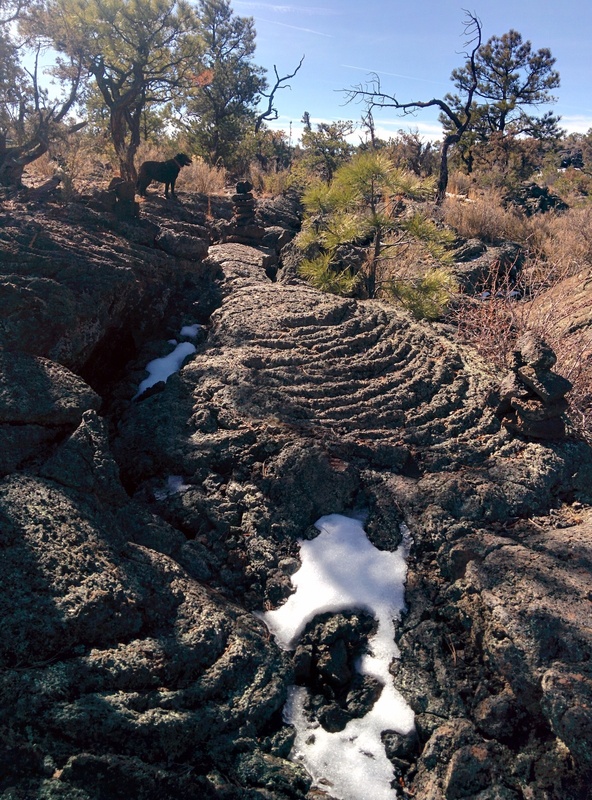 One of our favorite forms is called pahoehoe (“pa-hoy-hoy”). Here you can find numerous examples where the texture is smooth, ropy and coiled. It took that form as the lava cooled and hardened on the top surface while still being pushed from the underlying molten flow below. My whimsical (okay…juvenile) term for this is petrified dino diarrhea. 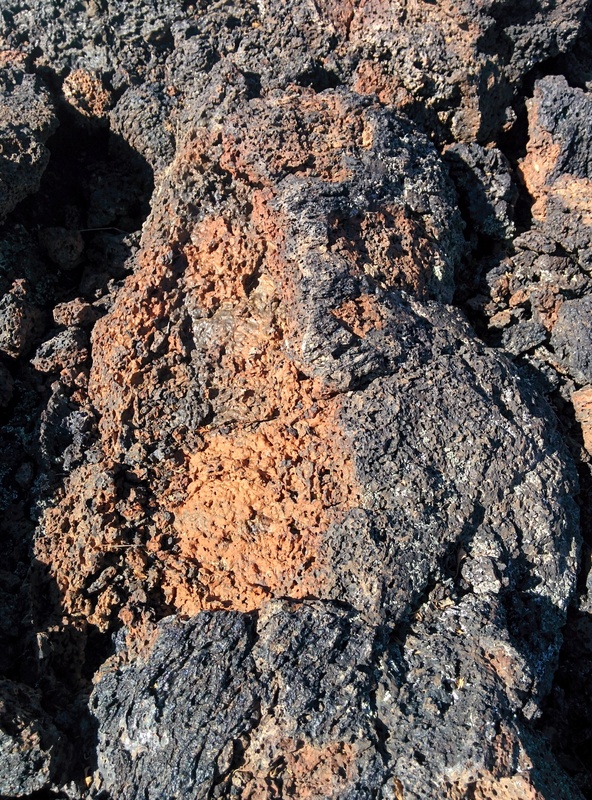 The other main type of lava is rough and broken and called a’a (“ah-ah”). While we (okay, just me) were giggling too hard at all the dino dung to seriously look for them we have heard that there are Xenoliths (meaning “foreign rock”) and Tachylite embedded all over the place. Xenoliths are fragments of the Earth’s mantle that were brought to the surface by fast-rising magma and encased as the lava cooled. Tachylite is glassy-textured basalt usually found embedded within other igneous rock. We found many examples where you could obviously see a place where an interior collection of still-molten lava was surrounded by a shell of cooler lava. When these “eggs” were broken open thousands of years later the two distinct layers are seen. There are many collapses and depressions throughout the area. When the lava flow was still hot gases worked their way to the surface and created mounds much like a rising cake in an oven. Many times when the gases broke through and escaped the mounds collapsed even while they were cooling and hardening. Somewhat the opposite of the collapsed depressions are pressure ridges which are features of lava formed by lateral pressures which almost always have a large crack running across the top caused by continuing pressure being applied even as the surface was cooling and “crusting” over until the crust cracked. 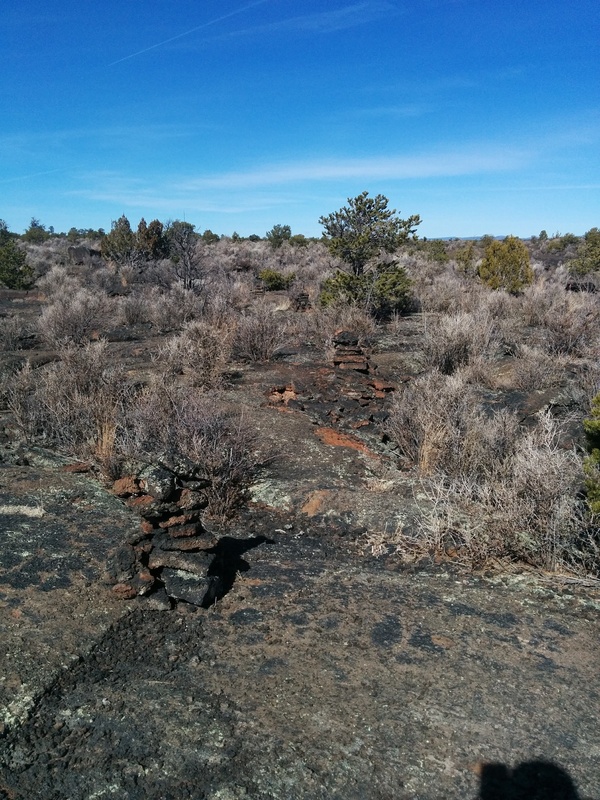 Throughout the area are many examples of especially small Ponderosa and Piñon pine trees. Somewhat of a pygmy forest. At first glance one might think these just small, young trees. On closer examination though you will notice that they are not just small but actually gnarled and stunted almost like natural Bonsai. 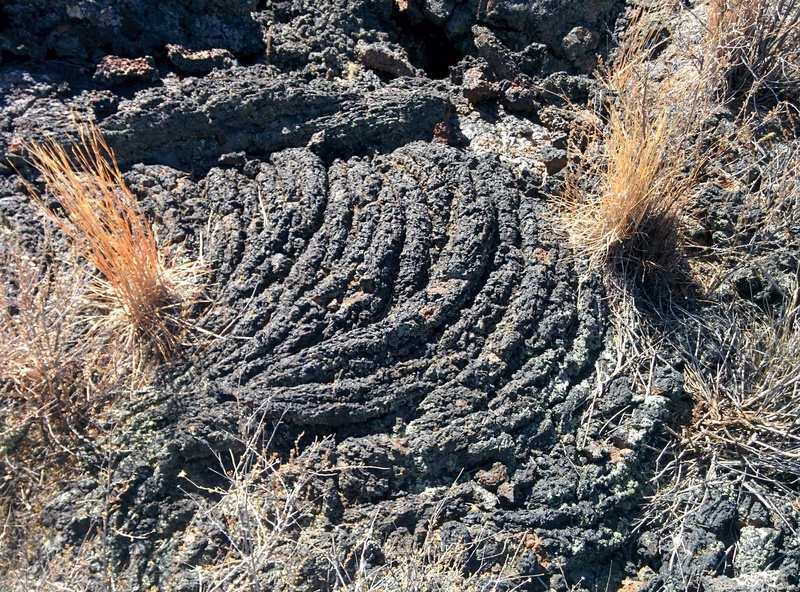 This is caused by the harsh environment and the fact their root systems are twisted around in the small fissures of the lava searching for whatever small amounts of water and nutrients they can capture. These trees get just enough to survive, but not enough to thrive and reach the heights of their brethren lucky enough to have germinated in a more “normal” soil environment outside of the lava flows. 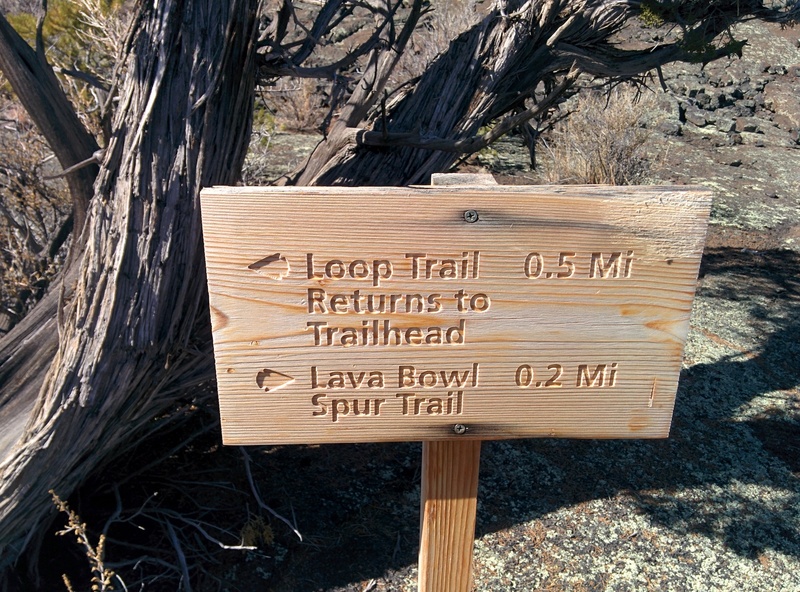 Towards the back end of the trail there is a short, two tenths of a mile extra section which leads to a natural amphitheater called the Lava Bowl. The bowl looked much like a larger version of a collapse depression but is instead an example of an inflation ridge. The same forces that created a collapsed bowl were at work here. Rising gases within a cooling area lifted molten rock into “walls” instead of a dome. Beside the shape the main difference is that these walls cooled before the gases could break free and allow their collapse and so the inflated ridges hardened in place into the forms we can see today. Partial Panorama Looking Into The Amphitheater. Black Dog For Scale. Click For A Larger View. Inside the bowl were several of the larger fissures we saw all over the entire area as well as the largest cairn of the day. Not sure why it was so much larger than any other cairn on the hike and there were no other cairns within the Bowl so we decided to offer it several options for its own mythology. We pitched these ideas: this is “The Most Interesting Cairn In The World,” or “The One Cairn To Rule Them All,” or “The Father Cairn From Which All Other Cairns In The Area Were Sired.” We’ll let you know when we get a definitive response from the cairn on its decision in this matter but we will not be holding our collective breath. Right about now is when we both realized that I was a Big Dummy and had neglected to bring water with us. Luckily there were many shaded areas that still held large amounts of nice, clean snow. I collected a hunk the size of Willow’s head and let her have at it. 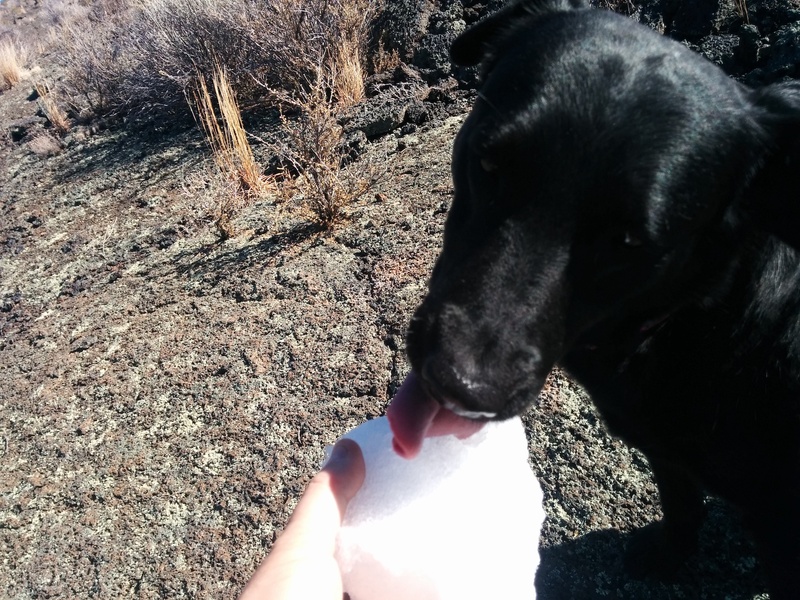 When it got too cold to continue holding it I dropped it on the lava beside her and she continued to work on it until it was all gone. 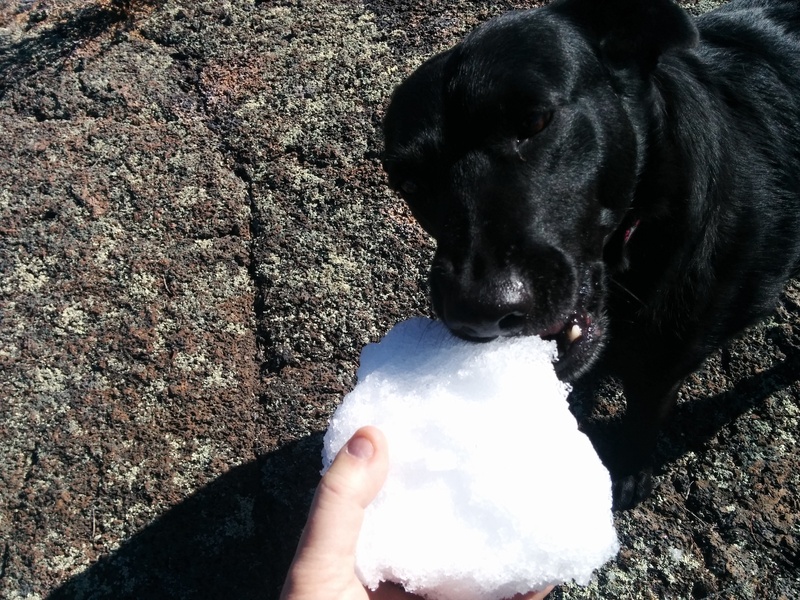 She was perfectly happy using this method to re-hydrate herself and celebrated her refilled system by squatting and probably killing a two square foot region of ancient lichen with urea poisoning. Sorry lichen. Now with my thirsty girl happily fulfilled we began the half mile trek back to the Tacoma where I knew we had actual, liquid water waiting for us both. Truly one of the finest holiday, family, after-dinner movies ever made. Kidding about the “holiday, family, after-dinner” part, not about the rest of it. You’ve been warned. At about 100 meters away we broke from behind the cover of the little trees and into view and you could tell the driver saw us as the passenger immediately got back into the car and they quickly backed out and sped away in a cloud of dust by the time we were still 50 meters out. Taking a quick but thorough look around the Tacoma we didn’t notice anything obviously amiss which filled me we great relief. That and the fact I wouldn’t have to pull out pliers and a blow torch both of which I know exactly where they are in our load. Lucky for them that, while I’m a huge Fargo fan (own it from Amazon), carrying around a Sawzall (we have one and you should too) and a wood chipper (too big) is just not feasible. Now that we could relax and I could recover from the involuntary heart rate increase we took a few minutes to properly hydrate ourselves, eat a quick snack and reflect back on the day’s explorations. 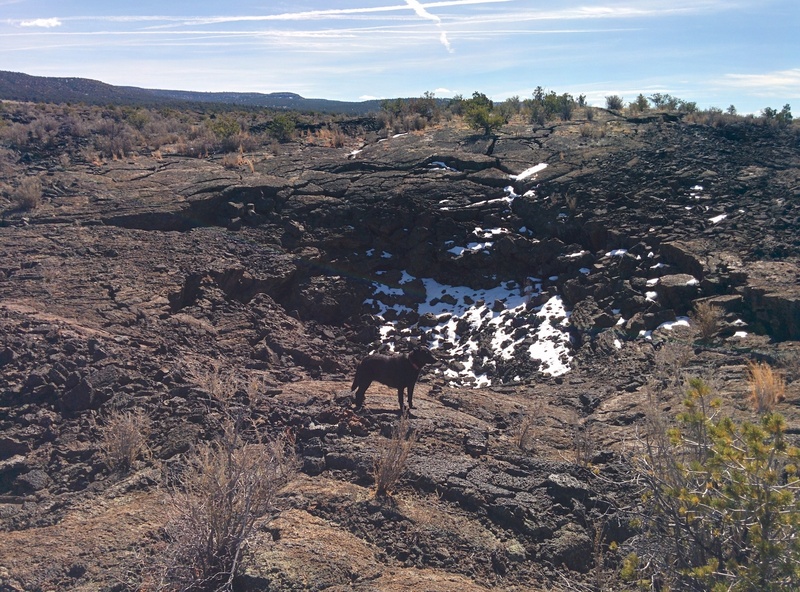 While not your typical, stunning green expanse full of beautiful waterfalls and vistas (although it certainly has some of those) the Lava Falls area of the National Monument still holds many interesting finds for those of varied interests and enthusiasms. History, geology, wilderness and hiking are just a few of the draws you will find here. 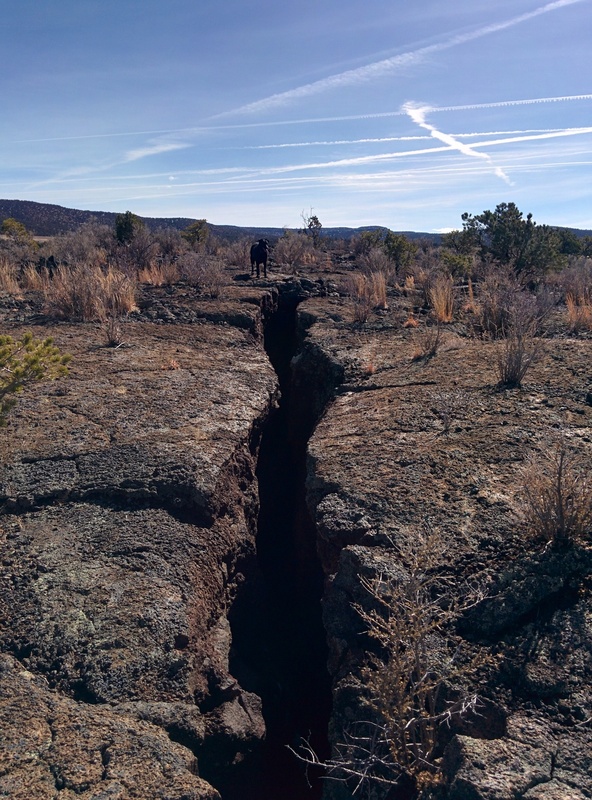 Along with all the other activities you can enjoy in the vast El Malpais National Monument it is surprising that barely more than 100,000 people visit each year.